Our fifth and final instalment of CPQ Perspectives focuses on the sales manager—those who oversee the selling operation. Sales management is full of challenges, and we can’t possibly touch on every issue that affects sales managers in this blog post. But, we can look at several tough issues and pain points and see how CPQ makes life easier for those who manage the selling process. What Matters to Sales Managers? Google “sales management challenges” and you will be rewarded with links to article after article of top 4, top 5, top 7 and so on, challenges standing in the way of sales managers and their pursuits of success. Some are slanted to inside sales, others to outside sales. Some are aimed at newly minted managers, others are for seasoned pros. It’s apparent that sales management is not a job for those who are motivated by easy money. After reading through several of these lists, I noticed some common challenges that seemed to be cited more frequently than others. The wording may not have been the same, but the underlying issues are quite similar. The first of these issues was related to training, coaching and mentoring sales reps. Many managers seemed to feel some inadequacy in providing this type of support, especially to new reps. In many of these instances, the issue wasn’t one of competence to provide that support, it was more related to time. Sales managers simply don’t have the time to spend in one-on-one training with each of their charges. The second issue had to do with the ability of the sales team to align their efforts with the marketing group so that the two teams are working toward the same goals. Marketing teams develop programs designed to help Sales uncover leads and opportunities. Sales teams should direct their efforts to exploit those leads and develop those opportunities. Managers have to guide the sales effort, using the marketing plan as a roadmap. The third issue is less common, but just as important to sales teams who sell complex or highly configurable products. This issue has to do with being customer-oriented or, better still, buyer-driven. The selling process has been essentially appropriated by the customer in recent years in a way that has effectively turned it into a buying process. Sales teams who understand and accept this transformation are going to be more successful than those who practice intrusive selling and product-pushing techniques. Everybody wants to bump up their numbers, increase team productivity, shorten the sales cycle and increase customer counts. A CPQ system may have a positive impact on each of these, but the high-level benefit is found in the three major issues we’ve identified. How Does CPQ Assist Sales Management? Let’s look at how CPQ helps sales management address our three big issues. A friend and roommate of mine from years ago made his way in the world by selling computers for IBM’s General Systems Division. At the time, these were the midrange computer products offered by Big Blue. What always impressed me about his approach to his job was the time he put in, largely after hours, reading material about the various systems he was charged with selling. His car (and our apartment) were literally awash in technical manuals, perfectly bound treatises and specification documents associated with each system. He spent hours each evening reading and absorbing that information. With each new release, product or market focus, the learning process would start over. Today, sales managers have the task of trying to motivate their sales reps to do the same thing. Complex, technical or highly configurable products require substantial knowledge and familiarity to effectively sell. Sales reps have to understand the issues the product is designed to address; they have to know what features and options are available to help them address the pains experienced by the customer. CPQ simplifies much of this learning process by taking the burden off of the sales rep and placing that specialized knowledge into the interview questionnaire, which drives the seller/buyer conversation during the buying cycle. The sales rep can literally follow a script, asking relevant questions. The buyer supplies answers that drive further questions related to refining specifics that are critical to properly identifying the options and features needed. This process results in the eventual configuration of a solution that’s perfectly aligned with the customer’s needs. The sales rep doesn’t need to spend hours learning a lot of esoteric information, and the sales manager doesn’t need to assign a technical asset to the sales team in the field. Training and coaching requirements are mainly limited to selling techniques and trade craft. Marketing and Sales management must agree on the market, product, audience and message. This agreement is the foundation for successful alignment. When the sales rep tries to respond to buyer needs outside of the target, the failure risk is high. But, more importantly, the time and effort expended in the futile selling exercise are not spent addressing the market where success is much more probable. CPQ helps prevent this by not providing support for pains and markets outside the envelope of the sales and marketing plan. Options and features needed to address issues outside your target are simply not available. The scripted interview questions will not identify a proposed solution for a disqualified opportunity. Sales managers won’t have to spend time in sales-intervention sessions with their reps, because their reps will not have the resources to pursue an out-of-market application. Opportunity disqualification is a part of selling, and the sooner a bad opportunity is disqualified the better. Most misalignment efforts happen when reps try to breathe life into otherwise disqualified opportunities. CPQ heads this off quickly. Buyers have many resources at their disposal to educate themselves about their own pain points and issues, possible solutions to those issues and sources for those solutions. This has not resulted in the elimination of Sales, but it has resulted in the role of Sales changing. Sales reps used to spend days dialing the phone hundreds of times in an effort to obtain an opportunity to call on a customer and present their pitch for this or that product. That process can still result in a sale, but it is highly inefficient. Companies are better-suited to building attractive sources of information and establishing themselves as trusted sources of information for the curious buyer. Placing these resources online and tracking visitor behavior is much easier than smiling and dialing for months at a time to find a prospect. The informational resource consumer reveals their interest through online behavior, and Sales can qualify that interest by offering additional information through direct interaction. That interaction is driven by CPQ and the interview questionnaire. The questions posed during the interview pull real information that’s useful in the process of aligning solution with need. Ultimately, this same scripted question-and-answer process results in a fully configured product “designed” by the buyer based on the buyer’s stated need and requirements. That’s what being buyer-driven is about. Sales management doesn’t need to ride herd on the sales force to be sure they are engaged in high-potential, productive calls rather than plowing through endless lists hoping for a hit or struggling with misaligned opportunities. Managing a sales force is not the same job it was even 10 years ago. Technology has ensured that products will develop and evolve more quickly and with more complexity than ever before. Much of that is driven by rapidly evolving needs and requirements on the part of the buyer. Useful market life may be more abbreviated for almost any product, and any delay in exploiting a market opportunity will likely spell failure to those who are late to market. Getting Sales knowledgeable quickly is essential. 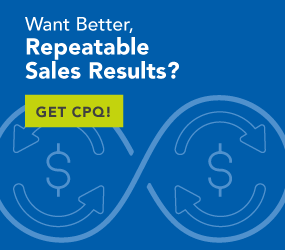 CPQ takes much of the load off the shoulders of sales management by automating product training, sales and market alignment and supporting a buyer-driven process.